Without the springs, your door won't be able to move. These components help even if you try to open your door manually. They support the full weight of the panels and provide the necessary tension-based force that allows you to move your door with very minimal effort. If the springs break, or if their tension loosens, you need to have an expert take care of them as quickly as you can. There are two different types of these components that exist today. Both are under a lot of tension on a regular basis and must be handled by professionals due to the risks involved. Extension springs stretch and contract in order to move your door. They are installed in pairs, one on each side of the door. Because of the way they work, when an extension spring breaks it can go flying, and will undoubtedly injure or damage any person or object in its path. That's why replacing them can be extremely dangerous and must only be done by a specialists. This type of spring is installed above the door, threaded across a steel bar. 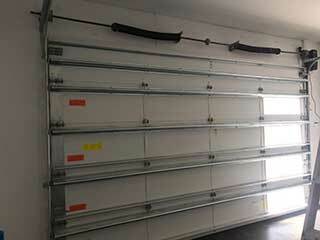 It uses a twisting motion applied via torque in order to lift the door off the ground. Aside from helping it work smoothly and silently, regular lubrication will also increase its lifespan, as it will reduce the operational stress the torsion spring is under. If it loses some of its tension, it may make the door open or close unevenly, which is why adjusting it regularly is so important. Once again, this is a risky task, and you should have our technicians perform it, rather than try to do it yourself. No matter what's wrong with your springs, you can count on our experts at Garage Door Repair Rocklin to handle the problem safely. Call us today.